The S.H.E. Fund was inspired by the courageous and dedicated girls of the Tasaru Rescue Center in Narok, Kenya. Also known as the V-Day Safe House, the refuge was created in 2002 by Agnes Pareyio, a Maasai visionary, in collaboration with V-Day, to help Maasai girls escape the tribal traditions of Female Genital Mutilation (FGM) and early childhood marriage, and to provide them with primary and secondary education, a right denied women in the Maasai tradition. Every year six to ten girls from the Safe House graduate secondary school. Each has been reconciled with her parents in a beautiful ceremony that includes villagers from miles around. 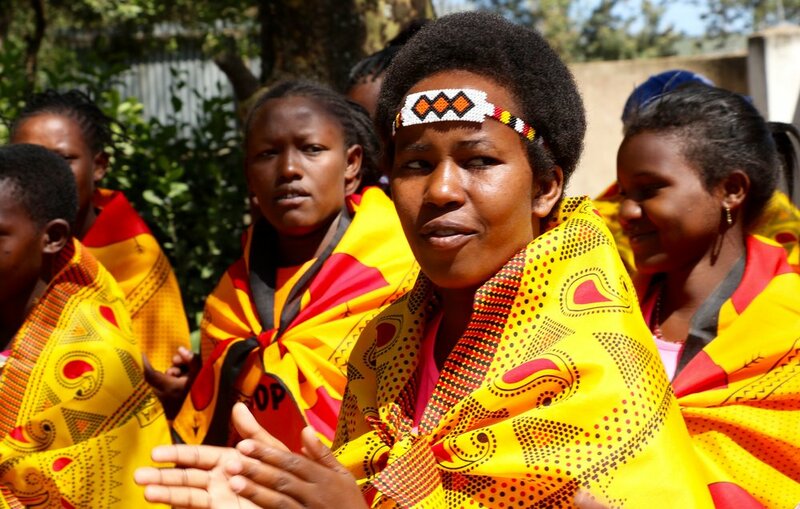 She has transformed her family and community by becoming the first female in her village to complete high school and return to the community an empowered young woman. The S.H.E. Fund is the next step, offering support for college to those students who choose to continue with their education. Those currently supported by the S.H.E. Fund are studying Early Childhood Education, Business, Accounting, Nursing, Community Development, Medical Technology and Peace and Conflict Resolution. They will emerge from these programs with the skills and maturity to make their way in the world, and, by their example, break to the cycle of oppression in their communities. The S.H.E Fund differs from most other educational funding organizations for young women in Africa, because it is our commitment to fund every student from the Safe House who graduates secondary school for one to four years of college, regardless of her grades in school. Most other organizations only extend funding to the students with the best grades. The significance of this difference cannot be overstated. The S.H.E. students come from extremely rural settings where education of women is forbidden. Thus these are the students who can make the greatest impact on their tribe, culture and the story of women in Kenya. They are the young women who will transform their villages when they return educated and empowered, because they are the ones who come from the areas with greatest poverty and the most deeply entrenched oppression of women. Their success in college has an exponentially greater impact on their communities than if we were to choose only the best students. To provide girls of the V-Day Safe House in Narok, Kenya with college, university or trade school education in order to support these young women to become change-makers in their communities and stop the cycles of oppression (Female Genital Mutilation, Early Childhood Marriage and the refusal to educate females) in their culture and on our planet; to offer these students scholarship for tuition, all living expenses, as well as deeply engaged mentorship from S.H.E. staff and funders as they face the tasks of becoming leaders in their communities and the world; to foster as many as many student-donor relationships as possible, in the knowledge that the cross-cultural human connection will change the lives of all. In the last chapter of Saved by a Poem, Kim writes about her first visit to the V-Day Safe House for Maasai Girls in Narok, Kenya. Initially, she was paralyzed with shyness and most of the girls were too. In an awkward moment one young woman, Jecinta, stepped forward and asked her to sing a song. “What I really love is poetry,” she responded. “May I recite a poem to you?” The miracle that ensued forged a life-changing connection for all of them. As the last lines of Mary Oliver’s “The Journey” echoed — “determined to do / the only thing you could do / determined to save / the only life you could save” — many of the girls were in tears of recognition. So was Kim. In 2010, Jecinta reached out to Kim to help her to get funds to go to college. Kim joined with several friends to raise the money, and Jecinta flourished. This was due not only to the financial support she received but also to the emotional impact of the human connection with those who believed in her. Funders also were profoundly moved by the opportunity to have direct and ongoing relationship with the student. In subsequent years, Kim raised funds for six more girls to go to college. Witnessing the life-changing impact on the young women, and also how they are now transforming their families, villages and tribe as a whole, she was inspired to create the S.H.E. Fund. In 2019, the S.H.E. Fund has 30 students in school and 11 graduates. Each year six to ten girls from the V-Day Safe House graduate secondary school. Let's support these extraordinary young women to get an education that will transform their lives, their culture, and this world we share. Let's do it in perpetuity. Contribute to the General Fund. We welcome donations of any amount which we combine to support students who do not have a Primary Funder and to cover the operating expenses of the S.H.E. Fund. Make monthly, quarterly or annual contributions to the S.H.E. Fund.